Home PAGASA DOST-PAGASA: Forecast Weather Condition for New Shallow LPA and Amihan as of 4:00 PM 29 January 2019. 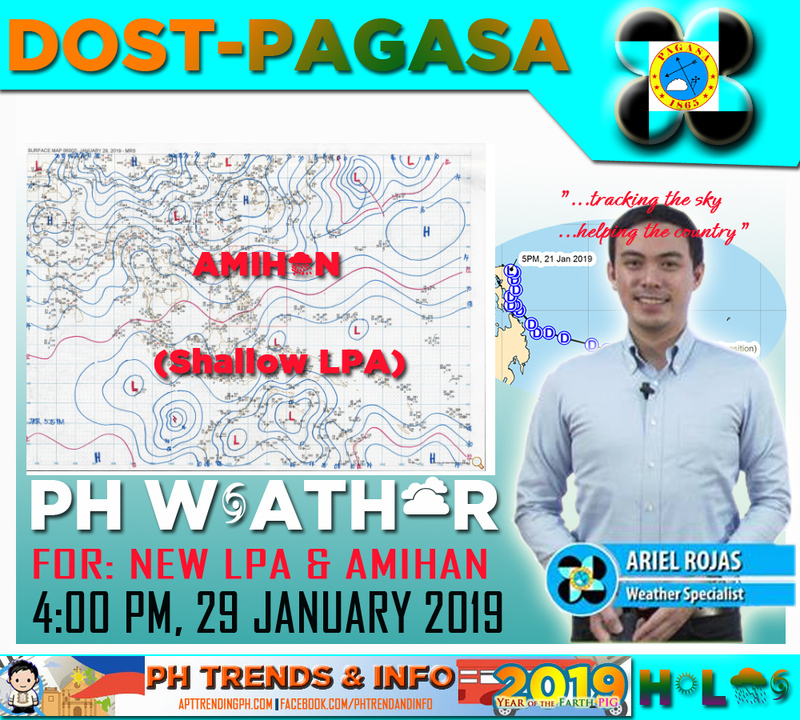 DOST-PAGASA: Forecast Weather Condition for New Shallow LPA and Amihan as of 4:00 PM 29 January 2019. Synopsis: Trough of a Low Pressure Area (LPA) affecting the southern section of Mindanao. According to Ariel Rojas, Weather Specialist of PAGASA, the Shallow LPA is expected to dissolve within 12 to 24 hours. While Northeast Monsoon affecting the rest of the country. Sultan Kudarat, Sarangani, South Cotabato, and Davao Occidental will experience Cloudy skies with scattered rainshowers and isolated thunderstorms due to Trough of LPA. Possible flash floods and landslides due to scattered light to moderate to at time heavy rains. Cagayan Valley, Cordillera Administrative Region, Caraga, Northern Mindanao, Aurora, Quezon, Rizal, Oriental Mindoro, and the rest of Davao Region Cloudy skies with light rains due to Northeast Monsoon. No significant impact.